We have received several questions recently from members regarding mailings that offer insurance or other products for purchase related to their mortgage account. Many companies will research and utilize the information contained in public records for solicitation purposes. 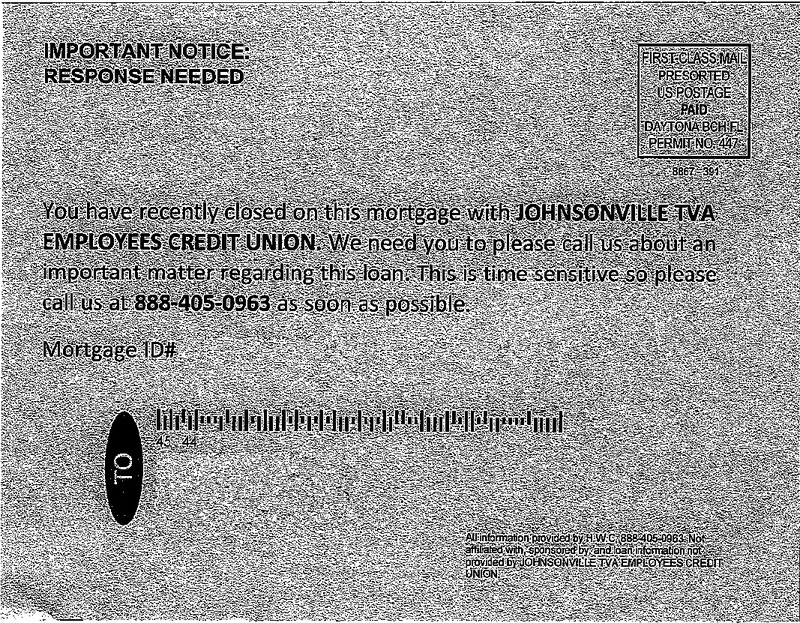 Please be aware that these types of mailings are not from Johnsonville TVA Employees Credit Union. The Credit Union is not affiliated with these companies, nor has it provided information regarding your account to these companies. If you have any questions about your account or any communication you may have received from Johnsonville TVA Employees Credit Union please contact us at 800-338-4609 or visit your local office. 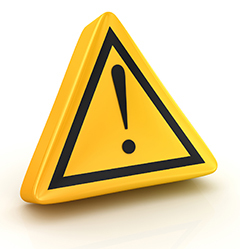 Be aware of notices you might receive concerning mortgage loan accounts. If you receive a notice please contact the Credit Union. Beware of IRS scam calls that will threaten to arrest you if you don't pay their stated amount. The IRS will never call you with these demands and threats. It has been brought to our attention that mail is being delivered to some members stating that their “Property warranty is getting ready to expire or may have already expired”. If you receive this letter dispose of it and do not call the number listed. The letter will be coming from “AWG Home Warranty Division”and is not associated with the Johnsonville TVA Employees Credit Union. We do not offer a Home Warranty service. This letter is a scam. We received word from the Tennessee Department of Financial Institutions that a group of scammers in New York have targeted people in Tennessee by requesting account information by phone or website link. This was not a data breach from the Credit Union. All account information is secure and has not been shared or hacked. This is a blanket scam, meaning scammers purchased a list of phone numbers and sent texts to all numbers on the list, not knowing who is actually a Member. Please be assured, the Credit Union takes every precaution to protect Member information and did not experience any type of account breach. If you did reply to the scam, please contact the Credit Union at (800)338-4609. A Member Service Representative will be happy to check your account and advise on how to proceed. Avoid clicking links within text messages, especially if they are sent from someone you don't know. But, be aware, attack messages can appear to come from someone you do know, so think before you click. Don't respond to text messages requesting private or financial information. If you get a message that appears to be from your bank, financial institution, or other entity, contact the business directly to determine if it is a legitimate request. Review this entity's policy on sending text messages to customers. Beware of messages from "5000" or some other number that is not a normally formatted number. Scammers often mask their identities by using email-to-text services to avoid revealing actual phone numbers. If a text message urges you to act or respond quickly, stop to think about it. Remember, criminals use this tactic to get you to react before thinking logically about the situation. Never reply to a suspicious text message without verifying the source. Never call a phone number from an unknown text. Remember, do not give out sensitive personal information! The Credit Union will never ask for this information. With the national average for gasoline prices hovering at some of the lowest prices in over a decade, 35+ million people are expected to hit the road for Labor Day. Fraudsters are also aware of the potential for increased travel and will also be out in full force readying their skimmers at gas station pumps. In the last few years, gas pumps have been a favorite target for fraudsters to place skimming devices. In fact, more than 260 skimming devices have been detected in the last year at gas station pumps in the state of Florida alone. Aside from not having a liability shift on gas pumps to make them EMV compliant, many gas pumps also have a universal key lock making them extremely vulnerable to tampering. Once the skimming device is installed, it is often well-disguised and not noticeable to patrons. After the data is captured, fraudsters return to harvest the information from the skimming device or, in some cases, access and retrieve the data remotely. The harvested data is then used to manufacture counterfeit cards or the data is fraudulently distributed online. Look for security tape over gas pump cabinets to ensure it hasn’t been tampered with by unauthorized parties. If the security tape is removed, cut, or the gas pump appears tampered with, do not use it and report it to the manager. Use gas pumps that are located closer to the front of the gas station as fraudsters will typically place skimming devices at gas pumps away from the store to go unnoticed. Check your accounts regularly to spot any unauthorized charges. If you suspect your debit or credit card numbers may have been compromised report it immediately to authorities and to the Credit Union.